We have launched a festive chick adoption fundraising campaign to garner much needed financial support to care for our newest penguin patients. October to January is ‘chick season’ here at SANCCOB when there is an influx of abandoned African penguin chicks admitted to our three seabird centres in Table View (Western Cape), Cape St Francis and Port Elizabeth (Eastern Cape). Public support through our adoption campaign is critical to help the us care for the more than 100 chicks already admitted this year. 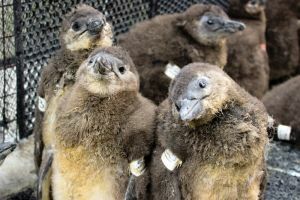 Members of the public are invited to adopt and save an African penguin chick and thus play a role in boosting the population of this endangered species. At R600, the adoption donation will go toward the cost of fish and medication, and enable the best care for the chicks before they are released back into the wild. In return, the adopter can name the chick and will receive a special festive-themed adoption certificate with a photo and brief history of the chosen chick sent via email. Penguin adoptions make for a unique festive season gift and help to make a real meaningful contribution to the survival of an endangered species. The African penguin is the only penguin species to naturally occur on the African continent and was listed as endangered by the International Union for Conservation of Nature (IUCN) in 2010. This penguin population faces many threats but one of the most significant is the mass abandonment of chicks that hatch late in the season. Our intervention to save the chicks is aligned with its African Penguin Chick Bolstering Project to boost the wild African penguin population by rescuing abandoned eggs and chicks to hand-rear and then release them back into the wild to bolster penguin numbers. The conservation intervention boasts an impressive release of almost 5000 chicks hand-reared and released since the project’s inception in 2006. The adopt-a-chick campaign runs until the end of December and adoptions can be made online here. Any donation is welcome to help us with our rescue effort and to save the endangered African penguin.